Google recently announced that over 4 million businesses now run on Google Apps, continuing its growth as enterprise software that focuses on collaboration. This of course is great news for Google Apps developers, since this means there are 4 million potential customers on the Google Apps Marketplace looking for complimentary tools to enhance their productivity. As you know, listing an app requires just a few quick steps, and the Marketplace targets a growing audience of customers ready to purchase additional solutions. So what kind of success might you see on the Marketplace and how can you maximize revenue? As the founder of GQueues, an online task manager, I have listed the app on the Marketplace since its launch in March 2010. Over the past year and half, I have found the Marketplace to be my most successful channel, and have discovered a few tips along the way that proved key to this success. Though this seems obvious, this first point is critical: make sure your app solves a real problem. This means you’ve identified actual people and businesses that have this problem and are actively looking for a solution. Perhaps they have already tried other tools or cobbled something together on their own. For example, I’ve verified Google Apps users are looking for an intuitive way to organize their work and manage tasks with others. GQueues fills this need as a full-featured task manager that allows users to assign tasks, share lists, set reminders, create tasks from email and tag work for easy filtering. 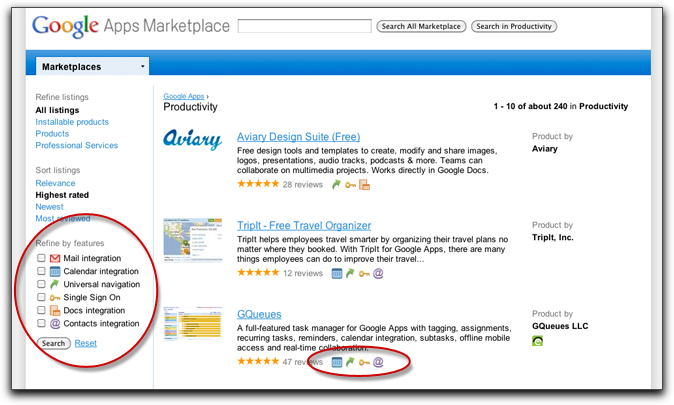 Google Apps users come to the Marketplace with a variety of needs, make sure your app addresses at least one of them. As you solve a customer’s problem, make sure you integrate with their existing tools. 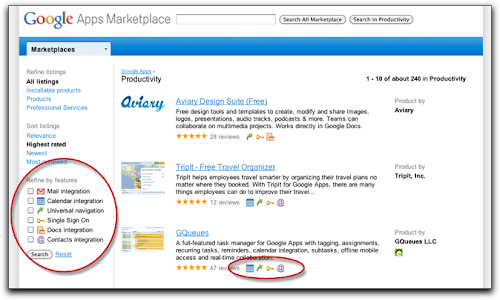 For Marketplace customers, this means adding as many integration points with Google products as possible. This is important for several reasons. First, it’s great for the user and facilitates adoption. If your service works seamlessly with other products they are already familiar with, they don’t have to spend time learning something new. For instance, GQueues has two-way syncing with Google Calendar. Since users already know how to drag events to new dates in Calendar, dragging GQueues tasks around the calendar is quite intuitive. Secondly, more integration directly helps your app’s listing in the Marketplace. Each listing has a set of icons representing product integrations. GQueues integrates with Calendar, Mail, Contacts and Google Talk, which indicates to a customer that using this tool will allow their users to work more efficiently. Plus, customers can search based on integration points, so the more you have, the broader your presence in the Marketplace. Lastly, integrating with existing products speeds development. Utilizing Google APIs allows you to innovate faster and respond to your customers growing needs. GQueues uses the XMPP service of Google App Engine, which eliminated the need to build a separate chat backend and makes it easy for users to add tasks by chatting a message from anywhere. Reach out to users leaving negative reviews to address their specific issue and understand better how the app can be improved. These actions are quite simple, but immensely effect your app’s presence in the Marketplace. Though each app is unique, I’ve found that following the tips mentioned above have helped the Google Apps Marketplace become GQueues’ top revenue channel. 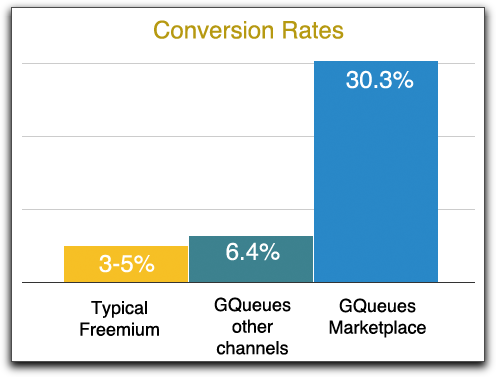 GQueues is based on a freemium model, and the average conversion rate for a typical freemium product is 3-5%. 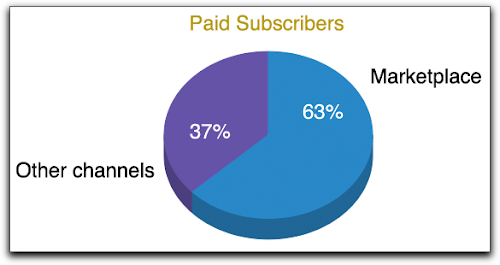 Looking at all the regular channels, GQueues has a 6% average conversion rate from free users to paid subscribers - slightly higher than expected. However, the GQueues users from the Marketplace convert at an astonishing rate of 30%. The Marketplace claims to target an audience ready to buy, and the data really backs this up. Not only does the Marketplace have a substantially higher conversion rate, but it also drives a considerable amount of traffic. 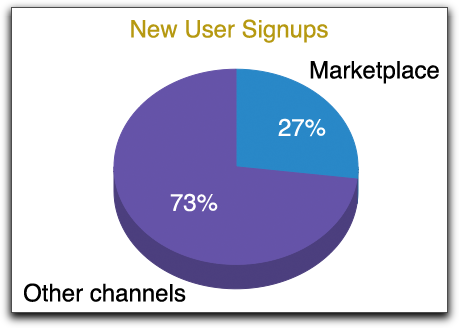 Looking at the data over the same period, 27% of all new GQueues users were acquired via the Marketplace. Combining the acquisition rate with the conversion rate shows that the Marketplace is actually responsible for 63% of all paid GQueues users. As Google Apps continues to grow worldwide, the need for deeply integrated, complimentary business tools will also expand. Based on my experience with GQueues, I strongly recommend the Google Apps Marketplace as a rewarding channel for apps that integrate with Google Apps.